[S3330] Email from Shelby Wall dated August 2015 to Hunter Wayne Bagwell; Subject Line: Shelby Wall Bagwell's Family. 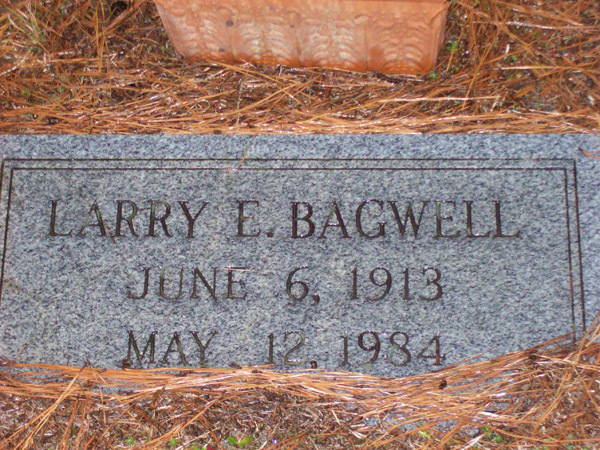 Earldine G. Bagwell is the daughter of Edgar Bryant Bagwell and Vivian Grace Holder. Her Social Security Number was (an unknown value) at 243-03-8002. 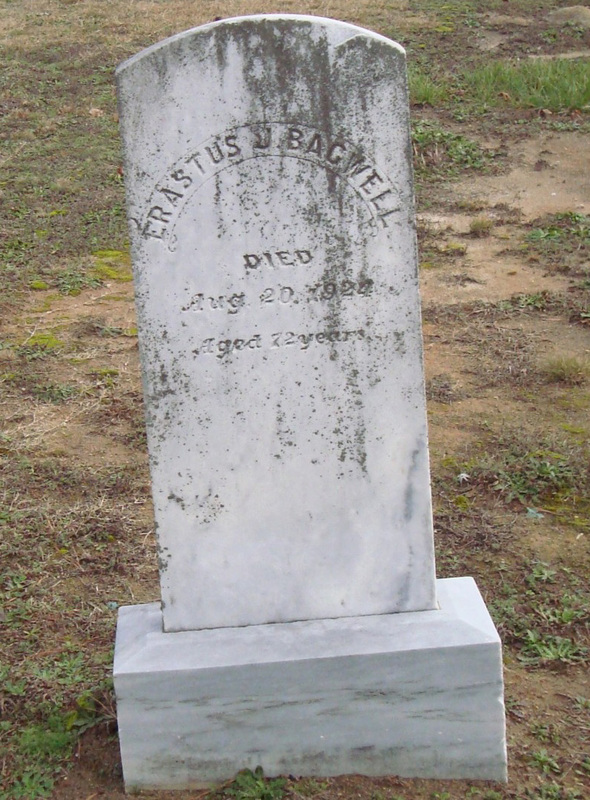 Isabell Hawkins Bagwell was born on 31 October 1900 in Wake County, North Carolina. She was the daughter of Calvin Berry Bagwell and Martha Cooper. 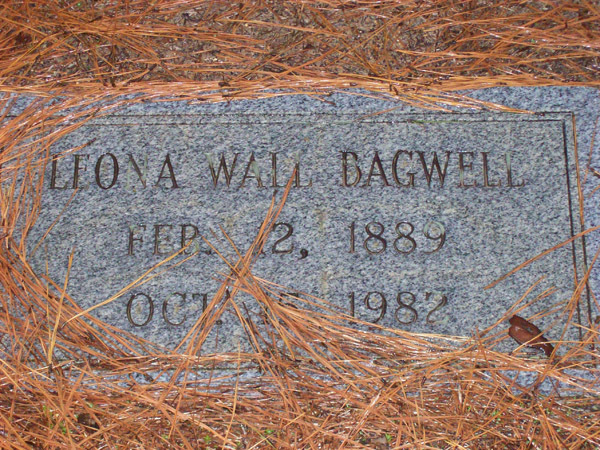 Isabell Hawkins Bagwell was born on 31 October 1905 in Wake County, North Carolina.1 She died on 29 August 1969 in Raleigh, Wake County, North Carolina, at age 68 of myocardial infarction. She was buried on 1 September 1969 at Oakwood Cemetery, Raleigh, Wake County, North Carolina. [S427] United States Federal Census, Washington, District of Columbia, Population Schedule: Indianapolis Ward 12, Marion, Indiana, Emuneration District: 213, Supervisor District: 7, Sheet: 3B, Dwelling: 49, Family Number: 59, Date: 1910. [S428] United States Federal Census, Washington, District of Columbia, Population Schedule: Indianapolis Ward 11, Marion, Indiana, Emuneration District: 209, Supervisor District: 7, Sheet: 7B, Dwelling: 176, Family Number: 185, Date: 1920. [S429] United States Federal Census, Washington, District of Columbia, Population Schedule: Indianapolis Ward 12, Marion, Indiana, Emuneration District: 219, Supervisor District: 7, Sheet: 2B, Dwelling: 35, Family Number: 36, Date: 1920. [S430] United States Federal Census, Washington, District of Columbia, Population Schedule: Indianapolis Ward 10, Marion, Indiana, Emuneration District: 49-404, Supervisor District: 8, Sheet: 20A, Dwelling: 263, Family Number: 268, Date: 1930. [S491] Marion County Marriage Records entry, Index to Marriage Record Book: 123;Page: 429 (1920 - 1925). [S497] United States Federal Census, Washington, District of Columbia, Population Schedule: Indianapolis Ward 10, Marion, Indiana, Emuneration District: 49-404, Supervisor District: 8, Sheet: 20A, Dwelling: 262, Family Number: 267, Date: 1930. Her Social Security Number was Not sure if SSN, birth and death at 309-48-8103. Alma Caroline Willett was born on 20 November 1902 in Marion County, Indiana.1,3 She was the daughter of Frank M. Willett and Mary R. Busald.4 Alma Caroline Willett married Timothy Edward Sullivan, son of Michael (Michel) Sullivan and Mary Dadell, on 6 May 1924 at Marion County, Indiana.1,2 As of circa 1925,her married name was Sullivan.1 Alma Caroline Willett and Timothy Edward Sullivan lived in 1930 in Indianapolis, Marion County, Indiana, (living next door to Alma C. Willett father and mother).5,1 Alma Caroline Willett died on 5 November 1991 at age 88. [S494] United States Federal Census, Washington, District of Columbia, Population Schedule: Indianapolis Ward 11, Marion, Indiana, Emuneration District: 203, Supervisor District: 7, Sheet: 5B, Dwelling: 90, Family Number: 98, Date: 1910. [S2201] Email from Joseph M Cahill dated April 2012 to Hunter Wayne Bagwell; Subject Line: Mary Busald. Beloved husband, devoted father, and loving grandfather and great-grandfather, passed away peacefully on Friday, March 30 surrounded by his family at the age of 85. His great charm, optimism, work ethic and enthusiasm for life will be deeply missed. He was born in Indianapolis to the late Alma C, and Timothy E. Sullivan. Upon graduating from Cathedral High School, Harold proudly served in the Navy during WWII and went on to receive his bachelor's degree from The University of Notre Dame. Harold began his career in the transportation industry as a trucking executive for various firms and was a member of the Indiana Motor Trucking Association since 1954. Harold "retired" in 2009 but continued to work part time as a consultant and was the emcee for the annual IMTA truck rodeo. Some of his fondest moments included a trip to Ireland for his 80th birthday with family, as well as the annual family vacation in Minocqua, WI. Harold is survived by his loving wife of 59 years, Carolyn, eight children: Tom (Sharon), Tim (Jeannie), Marianne Cappel (Paul), Pam Wickham (Paul) Mike (Ann), Colleen Nelson (Bill), John and Suzanne Richards (Gary) and 18 grandchildren, 9 great-grandchildren. He is also survived by his sister-in-law, Norma Sallee and brother-in-law, Dutch Roembke as well as many nieces and nephews. He is preceded in death by his sister, Rosemary Roembke. Harold, a devout Catholic was an extremely active member of Christ the King Catholic Church serving in many ministries over the past 60 years. Family and friends will gather Tuesday, April 3rd, from 4:00 - 8:00 p.m. at Feeney-Hornak Keystone Mortuary , 71st Street at Keystone. Funeral services will be Wednesday, April 4th, 10:30 a.m. at the mortuary with a Mass of Christian Burial 11:00 a.m. in Christ the King Catholic Church. Burial will follow at Our Lady of Peace Cemetery. In lieu of flowers, Harold asked that memorial contributions be made to Christ the King Catholic Church or to the Catholic Youth Organization. Memorial tributes may be offered at http://www.feeneyhornakkeystone.com. He was buried on 4 April 2012 at Our Lady of Peace Cemetery, Indianapolis, Marion County, Indiana. Rosemary Sullivan also went by the name of Posey Sullivan. She was born in September 1927.1 She was the daughter of Timothy Edward Sullivan and Alma Caroline Willett.1 Rosemary Sullivan married Raymond J. Roembke.2 Her married name was Roembke. Rosemary Sullivan was Rosemary was a service representative for NBD Bank between 1988 and 1994 at Indianapolis, Marion County, Indiana.2 She died on 27 June 2004 in Indianapolis, Marion County, Indiana, at age 76. Rosemary "Posey" Sullivan Roembke, 76, of Indianapolis, passed away Sunday, June 27, in her home. Mrs. Roembke was a member of St. Barnabas Catholic Church and had volunteered at St. Francis Hospital & St. Paul Hermitage. Mrs. Roembke is survived by her husband, Raymond J. "Dutch" Roembke, Sr., Posey & Dutch had owned & operated the Baskin Robbins at 46th & Arlington from 1972 until 1988. She had been a service representative for NBD from 1988-1994. Mrs. Roembke is survived by a son, Raymond J. (Cathy) Roembke Jr., daughters, Jan (Gary) Crist, Rosie (Paul) Looney, Kathy (Ron) Broughton, Karen Morgan, Barb & Claire Roembke, a brother, Harold E. Sullivan, 13 Grandchildren and One Great Granddaughter. A Mass of Christian Burial will be celebrated Thurs. July 1, at 10 a.m. at St. Barnabas Catholic Church. Friends may call Wednesday, June 30, from 3 to 8 p.m. at the Daniel F. O'Riley Funeral Home. An Evening Prayer service will be held Wed. at 7:30 at the funeral home as will morning prayers, Thursday at 9:30 a.m. Memorial Contributions may be made to St. Francis Hospice or St. Barnabas Catholic Church. [S492] The Indianapolis Star, June 29, 2004. Julia Sullivan was also known as Jewel Sullivan. She was born circa 1906 in Indiana.1 She was the daughter of Michael (Michel) Sullivan and Mary Dadell.1 Julia Sullivan married Amel deJeulio. Michael (Mickel) Sullivan is the son of Michael (Michel) Sullivan and Mary Dadell.1 Michael (Mickel) Sullivan married Ruth (?) after 1925. Carolyn Schaefer married Harold Edward Sullivan, son of Timothy Edward Sullivan and Alma Caroline Willett, on 18 October 1952 at Indianapolis, Marion County, Indiana. John Sullivan is the son of Harold Edward Sullivan and Carolyn Schaefer. Kathy Roembke is the daughter of Raymond J. Roembke and Rosemary Sullivan. Jan Roembke is the daughter of Raymond J. Roembke and Rosemary Sullivan.